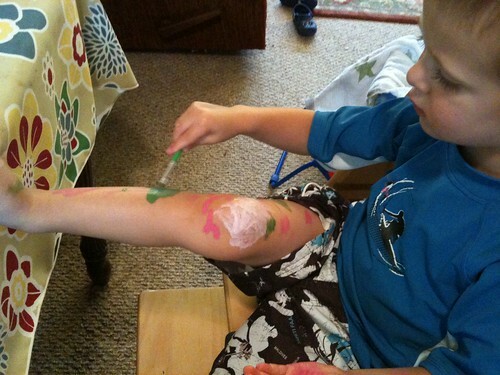 The kids love to get paint everywhere, and by everywhere I mean hands, arms, faces, etc. I worry a little bit about what is in the paint though, even the non-toxic stuff. So, I ordered some paint specifically for face and body painting, it is called Snazaroo. Great name, eh? I have no idea if it is better than the regular non-toxic stuff (more research needed) but at least it is designed to go on skin. The little palette we ordered has been a huge hit. 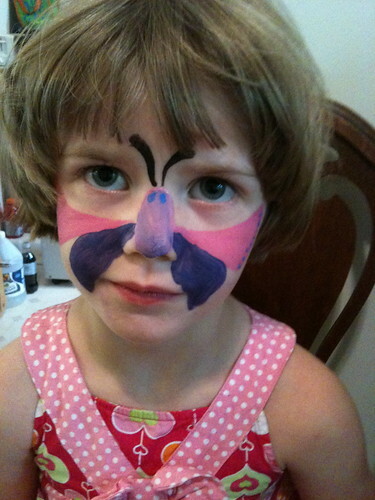 The kids love for me to paint up their faces (mostly with butterflies) and even more, they love to paint themselves. Legs, bellies, feet, arms — anything not covered by clothing becomes fair game. Added bonus: it is easy to wash off.